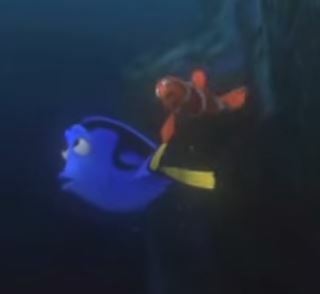 One of my favorite parts of Finding Nemo is when Dory and Marlin have to swim down into the dark of the trench to find the dive mask and Dory starts humming, “Keep swimming, keep swimming.” Coming from a cartoon fish with memory issues, that’s pretty damn good advice. I know I’ve hummed it to myself (along with running cadences picked up from various war movies) on long runs. Recently, I’ve found myself humming “keep writing” as I freeze up (again!) trying to get the words out. I had half-watched Finding Nemo a few months ago and when I re-read Stephen King’s On Writing, advice from Dory and King melded. King is awesome – and I’ve always loved his use of the word “shat” and, “The Lawnmower Man” short story is just flat out “WTF?!? !” Anyway, I look at this quote every morning these days. For the coming months, my daily workload has shifted from finding folks to write about X to being the one to write about X. As someone who’s not always been a fast writer, this has come with some growing pains, shall we say. It also reminded me of Shelby Foote who said he took years longer than he thought to write The Civil War, but who wrote 500 words daily. One word, sentence, paragraph at a time and, you keep grinding instead of waiting to “be inspired” and you’ve got one of the best histories ever written. I’ve come to love that King quote because it gets to the heart of what it is to be a writer – you aren’t a writer until you write. That’s one of those facile expressions that I used to hate seeing. On the other hand, it’s true. And it’s true for any profession or job, just go to work. Writing is, to state the equally obvious, a critical part of content marketing – both the “content” and the “marketing” component. All of it comes down to pen on paper (or however it is you get your writing started and done) and putting words in order to move someone to do something. What I’m learning and starting to really KNOW as opposed to understand on some conceptual level is that you’ve got to keep writing. And this brings me to content marketing. Articles are starting to matriculate down the Internet that content marketing is hitting a tipping point, that there’s too much content out there, etc. There is an element of truth – there IS a lot of content out there. And lots of bad content too – but, really, is that anything new? There has been good and bad marketing since there’s been marketing. Just because people started to think, “I’ll just write some stuff, shoot a video, and, man, people gonna LOVE me!” is no reason to stop focusing on content marketing. Every reputable source for content marketing, inbound, content strategy, and community management (which, in my mind, can be part of a good content strategy – and a “thing” in itself too, of course) harps on the need to give it time (Hubspot, Marketo, CMI Institute, Marketing Profs, SEO Moz, and so many others). Steady, consistent effort focusing on creating content that your audience cares about and is useful to them in some way (emotionally, for work, simply for entertainment, whatever) is and will be a fantastic way to attract and keep customers. I’m reading Predictable Revenue by Aaron Ross at the moment. While focused on sales, he also talks about many of the same concepts as for content marketing. He turned prospecting into a huge sales advantage for Salesforce, but it took him 6 months to begin turning the corner and over a year to really gain momentum. Ignore the drums starting to sound against content marketing. And, of course, keep swimming. Image clipped from the Disney video; embedded from Youtube.